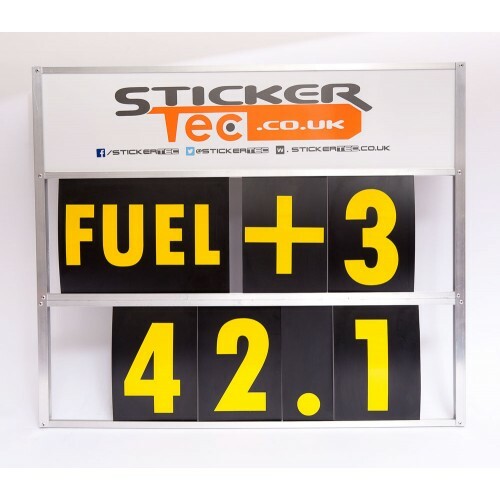 Our bespoke pit board is made entirely in house from lightweight aluminium to our own design, ideally suited to indoor and outdoor karting. We have reduced the size of our pit board to a more manageable, less cumbersome unit than normal Motorsport pit boards. Number blocks are 6" high by 4" wide with a choice of colour options. Each board is made to order to your own specification, add a team or driver name or even a sponsor logo, colours are also your choice, the number backings are matt black with a choice of matt number colours. We also supply a handy bag to keep your numbers safe during transit and on the pit wall. Please choose your colour options for the number cards and let us know Your wording or logo for the header board. If you would like this product in another size or style please contact us for a free quotation.